Dive into our fascinating collection of vintage advertisements and photographs! Archivists Sarah Newhouse and Megan Miller will discuss the ways that one successful scientific instrument company, Beckman Instruments, created and marketed their products from the 1930s through the 1980s. This presentation will showcase materials from the The Institute archives’ Beckman Historical Collection, with a special focus on vintage advertisements and photographs. Attendees will get to see massive analog computers, adorable mice, 1950s businessmen, retro-futuristic geodesic domes, and at least one advertisement in which a woman gives birth to a missile. There will also be a demonstration of our new digital collection, where science fans around the world can go to view digitized selections from our library, museum, and rare-books collections online! 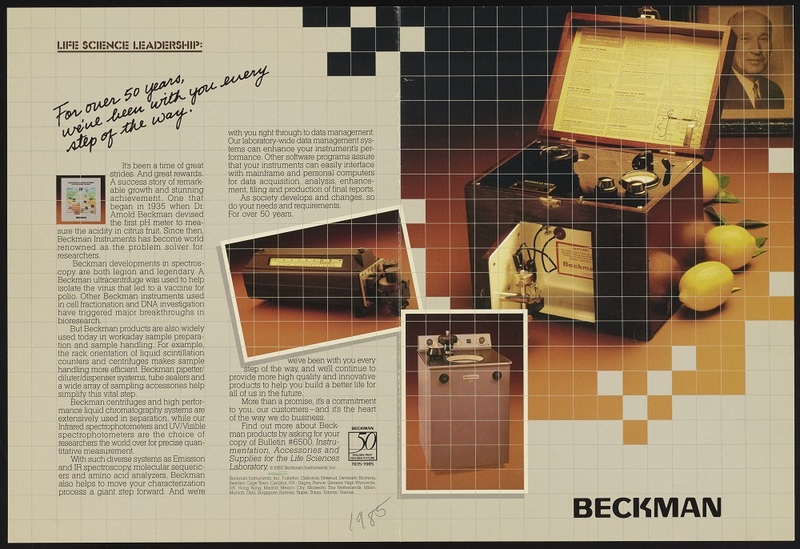 Image credit: Advertisement for various instruments made by Beckman Instruments, Inc., ca. 1985. The Institute Collections.